In September, Google announced that Google Apps would cease exporting to the older Microsoft Office document formats: .doc, .xls and .ppt. The change was to take effect October 1st. Google Apps would still be able to export to the newer open .docx, xlsx and .pptx file formats, but only Microsoft Office 2003 and newer can open those files without conversion. On Wednesday of this week after many complaints from its users, Google backpedaled and delayed the deadline to January 31 of 2013. It shouldn't be a surprise that Google wants to discontinue supporting these older Office formats, Microsoft has been trying to retire older versions of Office for years and will probably accelerate that process even more as Office 2013 nears release. I'm sure Google would love to have customers remain in and share from Google Apps and stop supporting Microsoft Office exports altogether. The Google announcement was made with only 4 business days (announcement on 9/26 of the feature change on 10/1) to prepare, and thousands of users and businesses that depend on Google Apps to interact with customers on older versions of Microsoft Office would have been left in the lurch, with no way to collaborate and exchange files. Google provided no transition period and offered little in the way of guidance on alternatives. They did recommend Microsoft's conversion utility, the Microsoft Office Compatibility Pack, that enables newer versions of Microsoft Office to read and save to the older file formats. While this utility could be used to enable conversion for those left in the lurch by Google's change it would require installation of the tool on many computers. Microsoft gives notice month's ahead of time when it makes changes to applications and then as a matter of routine offers an extended and unsupported time period before a product, format or feature is officially "retired." 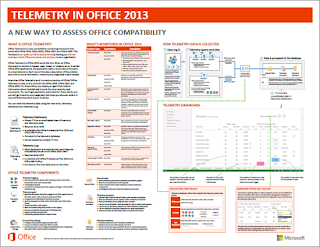 As a matter of fact, Microsoft just released Office 2013 compatibility content for the Office Resource Kit... including a nice easy poster (see below) that talks about how to retain compatibility with older Office versions even as Microsoft releases Office 2013. This is yet another demonstration for why organizations should take a long hard look before depending on Google, a service that was developed by a search company organized to create advertising revenue, to keep and protect their business data and reliably provide critical cloud infrastructure services. What other Microsoft products could you be using that Google plans to stop supporting? Internet Explorer 8! The alternative cloud service from Microsoft, Office 365, continues to gain traction in large and small organizations around the world, announcing new enterprise customers almost daily. Office 365 provides many more options for customers with packages ranging from some that include features similar to Google Apps all the way up to a suite that comes with a full desktop version of Microsoft Office Professional Plus 2010. With Microsoft releasing new versions of both Office 365 and Microsoft Office (2013) in the next few months, the gap between the features that Google includes in its Apps product and what Microsoft provides should widen even more. For organizations that demand the state of the art in productivity software there is still only one viable choice in the market, Microsoft. Similarly to Google Apps, Microsoft's Office 365 is a pay-as-you-go subscription billed monthly and by the number of users. For a flat monthly fee, users gain access to features including e-mail, a company intranet and instant messaging features among others. All of the applications are designed specifically for business, not for home users like Google Apps was (see Gmail). With a history that began with writing software for customers, not selling advertising, Microsoft has a credibility that Google can only wish for. To try Office 365 visit Microsoft at http://www.office365.com. To preview the latest upcoming changes with both Office 365 and Office 2013 you can sign up for the preview trial at http://www.microsoft.com/office/preview/en/whats-new. This continuous updates by Microsoft and "retiring" of older versions definitely impacts me as an owner of a Call Center Outsourcing Companies. While I do realize that this is how Microsoft earns, but sometimes it does become a burden on users. It would be great if users could pressurize Google to not just backpedal but reverse this decision to not have .doc and .ppt on Google Apps.